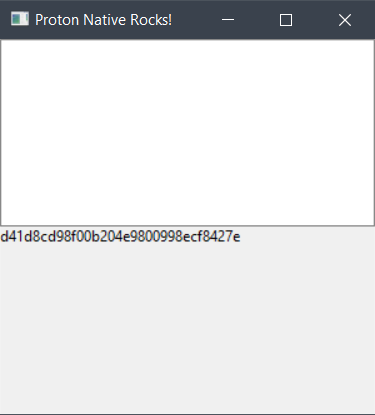 Today we are going to take a look at Proton Native and make a simple hashing app with it. Unlike Electron apps, apps built with Proton Native are actually native (hence the name) and not web based on chromium. 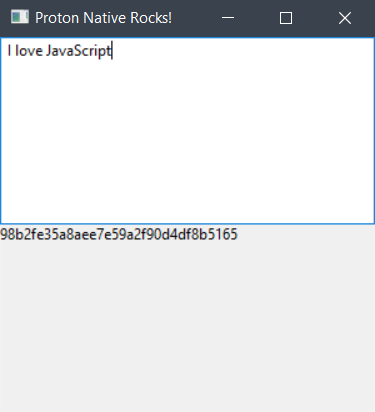 Proton Native is like React Native but for desktop, It compiles to native platform code so it looks, and performs like native apps. Now run npm i -g create-proton-app, and create-proton-app my-app to make a new project. Just like any React or React Native Project, we import the react library and make a class component. The App element is just a container that holds the Window and Menu, the Window has three props; title (the window title), size (takes an object that contains the width and height of the window), menuBar (set to false because we don’t want a menu bar). We will use crypto to hash the text to md5. I first imported Text and TextInput so that I could use them later, and then in the class after setting the text and md5 to empty strings in the state object I created a function hash that takes a text argument. and set the state object to the updated md5. The render method return some jsx element, the Box element is just like div in React or View in React Native which hold the TextInput and Text because the window element doesn’t allow having more than one child (what is this china … sorry). TextInput has an onChange prop that will be called every time the text changes, so we set it to a fat arrow function that takes a text argument and returns the hash function we created earlier. So now every time the text changes text is hashed using md5. You might say “It looks ugly let’s add some styling to it” well…at the time of writing this article, Proton Native is still in its infancy, very buggy and it doesn’t support styling (yet) but it’s a fun project to play with.